is now identified as one of the world’s healthiest drinks. Sugar-free green tea has 20% – 45% polyphenols by weight that can curb of free radicals and improve your longevity. They can improve artery function. They can increase body metabolism and you can go ahead with your work with increased energy level. Green tea has been proven to have remarkable health benefits because of its antioxidant polyphenols known as catechins, as well as L-theanine that have a calming effect. Green teas are good for health as they are not fermented and retains whole healthy constitute. 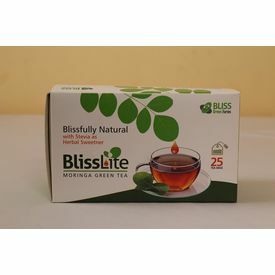 Bliss Lite Moringa Sugar-free Green Tea (Plain Flavor) is now identified as one of the world’s healthiest drinks. Sugar-free green tea has 20% – 45% polyphenols by weight that can curb of free radicals and improve your longevity. They can improve artery function. They can increase body metabolism and you can go ahead with your work with increased energy level. Green tea has been proven to have remarkable health benefits because of its antioxidant polyphenols known as catechins, as well as L-theanine that have a calming effect. Green teas are good for health as they are not fermented and retains whole healthy constitute.